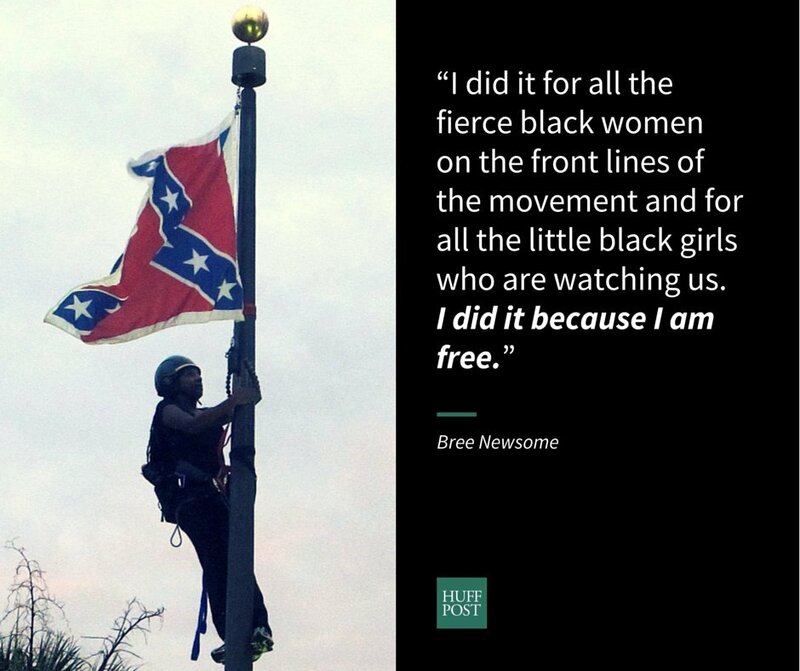 Black activist Bree Newsome says she refuses to be ruled by fear. Newsome’s intolerance to racial injustice and the horrific shooting that killed nine black lives are among the several reasons she said fueled her to take action. Saturday, Newsome climbed the flagpole outside of the South Carolina statehouse and removed the Confederate battle flag. “I removed the flag not only in defiance of those who enslaved my ancestors in the southern United States, but also in defiance of the oppression that continues against black people globally in 2015, including the ongoing ethnic cleansing in the Dominican Republic,” Newsome wrote on Tuesday in a statement exclusively obtained by The Blue Nation Review. Newsome’s actions were documented through photos and videos that dominated social media feeds over the weekend. Images of Newsome hanging from the pole and holding the flag in triumph prompted praise from Hollywood filmmakers, NAACP executives and thousands online who hailed Newsome as a hero. North Carolina NAACP President even compared Newsome to iconic civil rights activists Rosa Parks. In her statement, Newsome discussed her motivations for making such a moment in history. “For far too long, white supremacy has dominated the politics of America resulting in the creation of racist laws and cultural practices designed to subjugate non-whites,” Newsome wrote. Newsome’s criticisms of the flag are widely shared as petitions have launched in cities across the country calling on politicians and officials to remove tributes to the Confederacy. While some have obliged, others across the South have only fueled the debate. Meanwhile, the flag still flies high over the South Carolina State Capitol as the state awaits the legislature to discuss and vote whether the flag should remain on state grounds when they reconvene on July 6. However, despite debate on the matter, Newsome made it clear she has had enough. Although her actions led to her immediate arrest on charges of defacing monuments on Capitol state grounds, Newsome was later released -- and through it all, she still vows to carry on her mission to fight against racial injustice. From designers and dancers in Charleston’s tight-knit creative community to musicians who live hundreds of miles away, artists have addressed the racist attack at Emanuel AME Church, a historic black institution, that killed nine residents of their city. Their work (<a href="https://www.huffpost.com/entry/art-charleston-church_n_7654802" target="_blank">see more here</a>) shows how art helps us survive and strengthen amid tragedy.